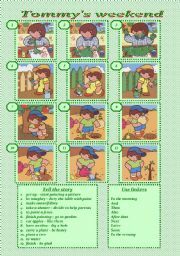 Story telling based on pictures for the youngest ss. They must use Past simple to tell the story. 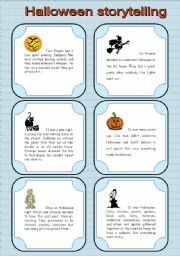 Hope it´s useful! Enjoy! 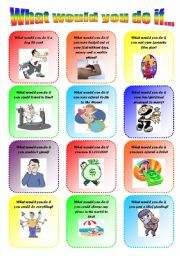 What would you do if... 1/2. Speaking cards, Second conditional. Editable! 36 cards for the conditional 2 practice. Have fun discussing unreal situations. 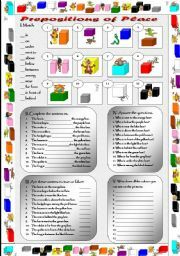 Ss draw cards one by one and answer the questions. Also the answer might be proceeded with a conditional chain. Enjoy!!! One of the students draws a card, reads the beginning of a story, then all students one by one add their sentences to compose a story. Then the next student draws a card and starts another story. There are cards for six stories. Have a nice Monday! 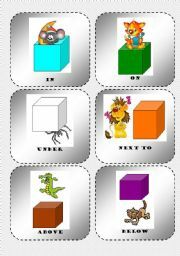 Prepositions of place - exercises + key. 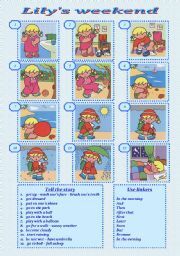 The exercises to practise prepositions of place. 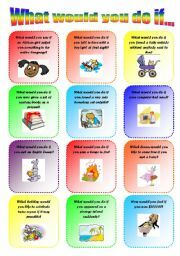 Using them your ss will revise animals and colours. 1. Match. 2.Complete the sentences. 3. true or false? 4. Answer the questions. 5. Write down the colours. I hope you like it! Enjoy! Ss follow the instructions and colour the picture. Plus two more ex-s (1. Unscramble the words & 2. matching). Thanks to Mena for the template!!! Hope you like it! Enjoy! 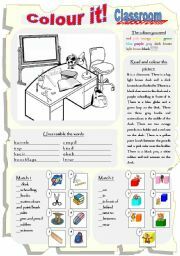 12 flashcards to practise prepositions of place. 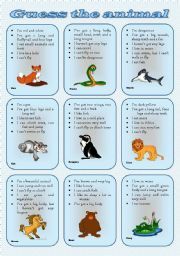 Using them your ss will revise animals and colours. I hope you like them! Enjoy! What would you do if... 2/2. Speaking cards, Second conditional. Editable! The second set containing 36 cards for the second conditional practice. Have a great fun discussing unreal situations. Ss draw cards one by one and answer the questions. Also the answer might be proceeded with a conditional chain. 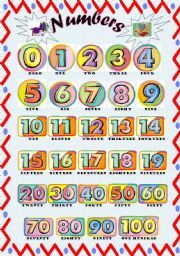 The first part is here http://www.eslprintables.com/printable.asp?id=434553#thetop Enjoy!! !